Three people were taken to hospital after an accident flipped over a car outside Clementi Mall on Saturday morning (Jan 26). The accident at the junction of Clementi Avenue 3 and Commonwealth Avenue West was alerted to the police at 10.25am. The three people, aged between 49 and 70, were conscious when taken by the ambulance to Ng Teng Fong General Hospital. They were two women and one man, all of whom suffered minor injuries. 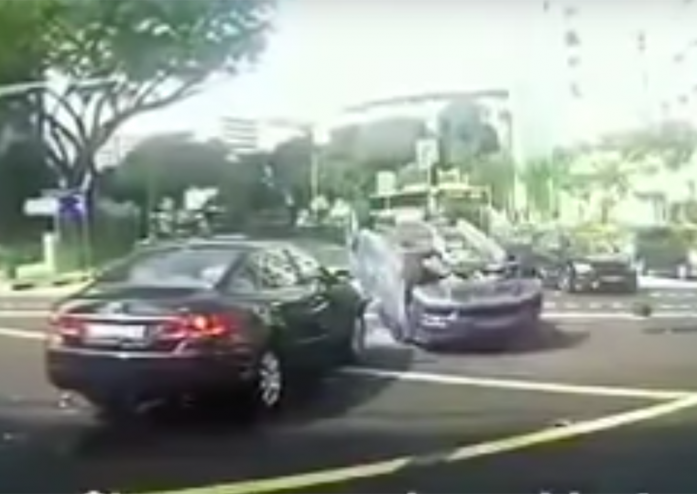 In this video, you can see a blue car travelling straight along Clementi Avenue 4 towards the junction in the direction of the mall. As it heads onto the junction, a black car travelling along Commonwealth Avenue West collides head-first into its left side. The force of the impact sends the blue car skidding a short distance and then flipping completely to land on its roof, with wheels pointing up. It is unknown if the three people injured were travelling in the blue car.